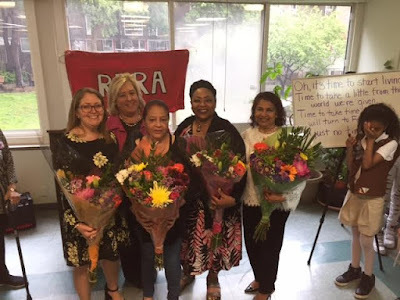 Roosevelt Islander Online: A Wonderful RIRA Roosevelt Island Mother's Day Community Celebration Honoring 4 Local Moms - Happy Mother's Day!!!!!! 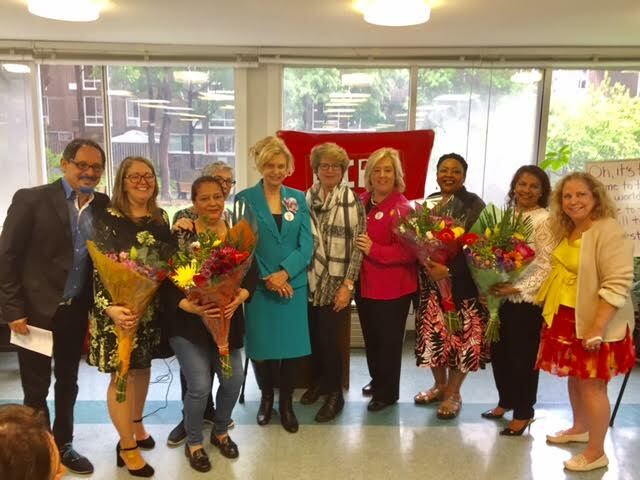 A Wonderful RIRA Roosevelt Island Mother's Day Community Celebration Honoring 4 Local Moms - Happy Mother's Day!!!!!! Happy Mother's Day wishes for all the moms out there. 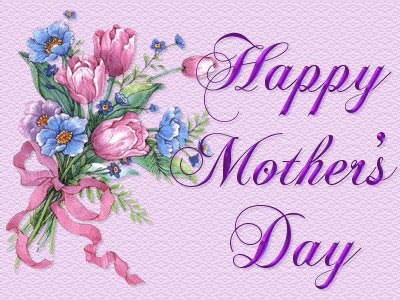 Give your Mom a Great Big Hug and Kiss today and tell her how much she is loved and appreciated. Roosevelt Island Residents Association (RIRA) Child, Youth & Education Ad Hoc Committee Co-Chair Adib Mansour reports on a wonderful Roosevelt Island Mother's Day Celebration held May 13. Yesterday, the Roosevelt Island Residents Association (RIRA) , Carter Burden Network, Roosevelt Island Disabled Association, and the Roosevelt Island Community Collaborative Coalition were thrilled to host a special Mother’s Day gathering at the Seniors Center. The event started with a welcome speech by Carter Burden Program Director Lisa Fernandez who emphasized the collaborative work between numerous organizations on Roosevelt Island. Lisa reminded the attendees that “everyone is welcome to the center whether it is you or someone you know”. Jeffrey Escobar, RIRA President welcomed everyone and described his goals as a committed advocate for greater community service. Mr. Escobar's tenure on both the Roosevelt Island Residents’ Association and Community Board 8 Manhattan has been to refocus the mission of both organizations on engaging directly with those who call Roosevelt Island home and to offer programs, services, and events where all Island residents, neighbors, family and friends can come together as a community, as well as to protect and insure the continuation of the quality of life on the Island through advocating for responsible community development. Assembly Member Rebecca Seawright was happy to be part of this community and delighted to partake in such notable events. She stressed the importance of women and mothers in our society and praised the advancements that women have achieved in business, sciences, arts, and politics. Speaking directly to the over 30 youths participants, Assembly Member Seawright praised them for being active in community service. She spoke about being a proponent of the advancement of women and supporter of women’s rights. She was particularly proud of her call for providing feminine hygiene products at no cost to menstruating individuals in schools, homeless shelters, and state & local correctional facilities. “Tampons are not luxury” and should be tax exempt. In 1977 and at the age of 11, Patty Fallone moved to “a very special place”, Roosevelt Island; she was one of the original new kids on the block. She loved the island’s sense of community, the safety and ability to develop an early sense of independence. In 1989 Patty married Anthony and they both raised 2 boys and 2 girls and were sure they made strong connections to Roosevelt Island. Patty herself coached soccer and baseball for 15 years. She was active at the St. Francis Cabrini Parish. Patty’s Husband wanted his children to be part of the Main Street Theatre & Dance Alliance, but sadly was not able to see their oldest daughter Katie perform the lead role in Alpha Girls. Anthony passed away on September 11, in the Twin Towers. The theatre brought glimpse of joy during the family’s intolerable pain. Patty is an exemplary mother who single-handedly raised her children to become entrenched in their community and works hard to make them the best they can be! Derl-Marie moved to Roosevelt Island in 2003, but she worked at the Gold Water Hospital since 1988 as a clerical Assistant with a love to help people. In 1998 she was diagnosed with a brain tumor, the worst news she ever got. Just before she underwent a major surgery, the only thing she was thinking about is that she will not make it alive. In the recovery room, she got the bad news that her mother passed away. She wanted to stand and shout, then arrived to the realization that God wanted her to be alive for a reason! That was the moment she decided to become a foster parent. In 1999 Khalif joined her family when he was 10 months old; followed by Josiah in 2005 when he was barely 10 days old. Derl-Marie has been an exemplary mother to her son Danny Evans Jr. as well as Khalif and Josiah. She is a grandmother to 2 girls and 2 boys. Derl-Marie has raised Khalif to become the Most Exemplary student in high school and works at an after school program helping younger students to become leaders of tomorrow. Josiah is in 6th Grade and is doing very well in school. He loves sports. Derl-Marie made sure to take them to every activities and programs Roosevelt Island offered from soccer, to baseball, summer camp, swimming, and theatre. 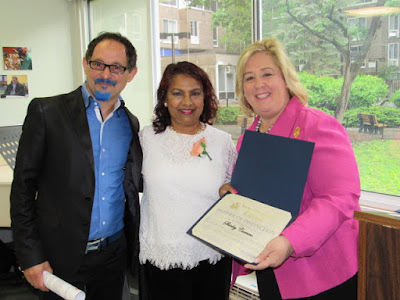 Shriley Carrero celebrated her birthday on Friday, and today she was honored for being an outstanding grandmother. She has been living on Roosevelt Island since 1976; she used to work at RIOC as a part-time receptionist, and volunteered at Coler Hospital. She is the grandmother of 4 wonderful children Taj, Tyler, Tia, and Trey. At one time when the grandchildren were very young, she moved to Kentucky however, when she heard that the they were in dire need of her help, she left it all behind and returned to the island without any hesitation. Since then, Shirley has been instrumental in insuring the 4 grandchildren receive the best education, healthcare, and community involvement. She has a hands-on unequivocal approach to raise them all. She makes sure they are constantly involved in the after school programs, all the sports, community service and leadership programs. Tia has been a stellar in RIRA’s Children, Youth & Education Committee participating in all our events. Alvie Rivera is a 28 yr resident of Roosevelt Island. She is a mother of 2 and grandmother of 6. She moved to Roosevelt Island along with her 2 children on march 23, 1989 after living in Spanish Harlem her whole life. As time went by, she started babysitting for other parents in this close knit community, performing odd jobs in order to sustain her family. She has always selflessly assisted others as needed. Alvie helped raise 3 of her grandchildren as well as her nephew, while taking care of her own. Her passion has always been to “help others”. Her other passion is cooking. She said that her cooking for others is her way of saying thank-you. Alvie started working at The Roosevelt Island Senior Center in 2009 delivering meals to the homebound for the Meals on heels program. She started working as a Kitchen Aide for the Senior Center in 2015 She remains working there to this day, waking up early every morning to provide coffee for our seniors and disabled residents. She says, “My goal for each day is to make sure that Our Seniors have a healthy and hot meal”. She is very well known in the community and is a blessing to all that cross her path, She continues to assist anyone who needs help. Last March 14th, during the snow storm, Pat was the only one who could get to the Seniors Center to be sure the seniors were served a hot meal at lunch and had coffee and social time in the morning. 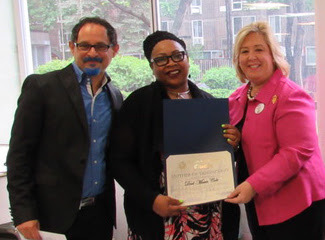 Assembly Member Seawright then presented an Honorary Citation to RIRA President Jeffrey Escobar for his leadership and Adib Mansour for bringing our community together. 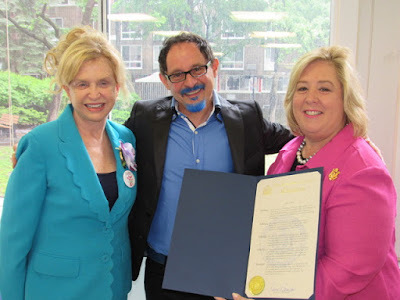 Congresswoman Carolyn Maloney enthusiastically joined the celebrations with a speech that reminded everyone to hang on to what is special in the community on Roosevelt Island. 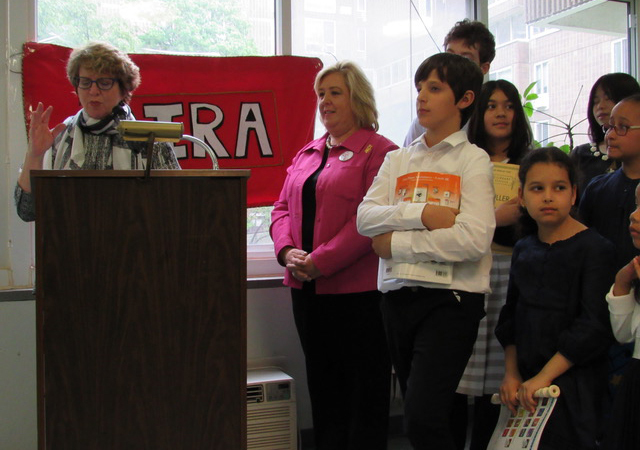 She stressed her continued unrelenting efforts in congress to get the Equal Rights Amendments passed. Congresswoman Maloney was thrilled about the future of Roosevelt Island with the opening of Cornell Tech’s Campus and all the high tech jobs it will bring to our community. She thanked Carter Burden’s Lisa Fernandez, Community Collaborative Coalition’s Wendy Hersh and Mary Coleman, as well as RIRA’s Children, Youth & Education Committee Co-Chairs Adib Mansour and Anne Heskel. was delighted to be part of this special occasion that put women and mothers on a pedestal. She recounted the joys of being a mother and her close relationship with her two children. Ms. Rosenthal gave a sweet account of her children holding on to her ankles every morning asking that she stays home instead of going to work. She also recounted the numerous times she told her daughter her favorite story every night, and when her son would pretend to fall off the bed, so she can cuddle with him a bit more. Following her speech, Ms. Rosenthal presented the 4 mothers/grandmothers honorees with beautiful bouquets of flowers and thanked them for being role models to their children and the community. and Mary Coleman for their invaluable help in preparing for today’s event, as well as RIRA's VP Lynne Shinozaki for her unwavering service to the community at large. 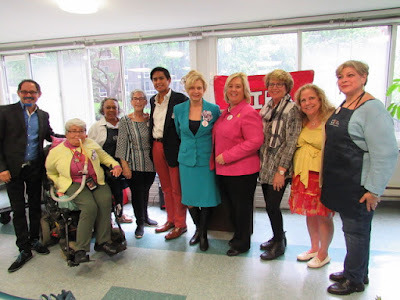 I introduced my Children, Youth & Education Committee co-chair Anne Heskel and expressed our commitment to connect Roosevelt Island's youths with their community by creating connections with their peers, the elderly, and the disabled community. Our mission is to offer them positive engagements for a flourishing future. Growing up in Lebanon as a youth during the civil war, I volunteered with the Red Cross and without my mother, would not be where I am today. My endless love for my wife and children are the reasons I want to give back to our community and build a bridge between the youth, the seniors and everyone in between. I see the potential of leadership greatness in every child on Roosevelt Island. The MSTDA presented 3 performances from their upcoming musical Pippin this coming Friday May 19th through Sunday May 21st, and a heart-felt sing-a-long by Musical Director Jonathan and his wife Kimbirdlee Fadner. The crowd sang their hearts out with smiles and happy tears. Mia Zurovac, a 16 year old islander wowed the crowd with a special rendering of Fly Me To The Moon accompanied on the piano by Ms. Shuang Yu. Mia dedicated the song to her mom, and said it was her dad’s favorite song. It is noteworthy that the Zurovac family, owners of the famous Pain d’Avignon who’s pastries are featured at the Plaza Hotel, donated over a hundred succulent croissants and brioches for the occasion today. The young Girl Scouts dazzled the crowd with Mother’s Day poems they wrote themselves or found for the occasion. Tia Young left the attendees speechless with a special dance she choreographed for today’s special event. Her energy and smooth moves impressed everyone who cheered her with enthusiastic applause. Following Tia, her friend Anyah Lamb presented us with a tender reading of A Poem For Mom, by Champagne Baker. She brought tears to many with her moment of silence before finishing the poem with “You are my love, my life……. my mom!" 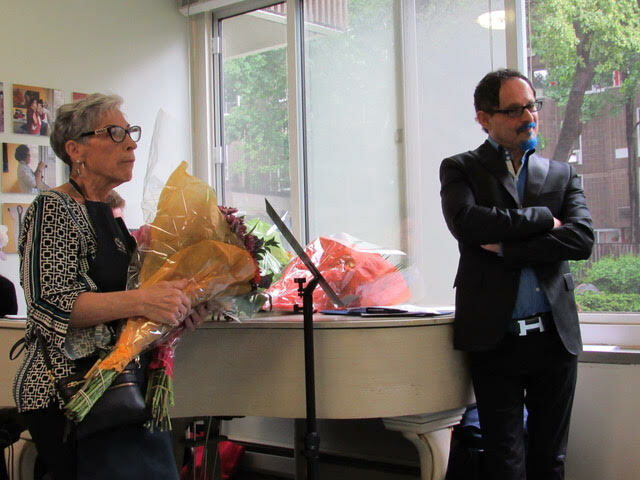 Wendy Hersh, one of the collaborators of the Mother’s Day Celebration, recounted her special relationship with the Seniors Center where her ailing mother enjoyed visiting every day, before passing away. A scrumptious brunch was served at 1PM while Ms. Shuang beautifully played Moonlight Sonata. 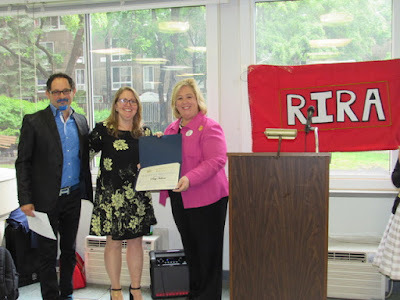 The RI Parents Network’s kids presented the attendees with handmade picture frames they crafted for this occasion while the Girl Scouts presented them with gift bags and special Happy Mother’s Day handmade cards and silk flowers. A very deep thanks to the following people and organizations that donated their time and efforts for this special celebration of Mother’s Day… a special time of year when you get to celebrate your first best friend and the person you always turn to when you need advice. Mother’s Day is also a great time to show your love for all the other wonderful women in your life. It is a way to show gratitude and love to your mother, grandmothers, sisters, aunts and friends. They are the roots where you came from and the anchor of where you are going!